Sinotyrannus meaning chinese tyrant is the king of all proceratosaurids and the biggest theropod dinosaur of its place and time. It was huge compared to other proceratosaurids. 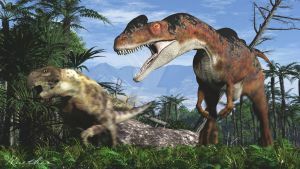 Normally, proceratosaurs were 2.3,5 metres long, but sinotyrannus was up to 10 metres long. The holotype consists of a partial skulls, fragmentary forelimb and hip bones. It isnt known if it had a crest but all other proceratosaurids had them, so it probably had one too. I'm not a fan of this picture of Sinotyrannus. I think your re-do from 2015 is much better and even my favourite Sinotyrannus of DevianArt. Can i use this for my facebook page? Impressive ! He's really frightening , hence his name of Chinese Tyran ! How many hours do you spend on those draws ? 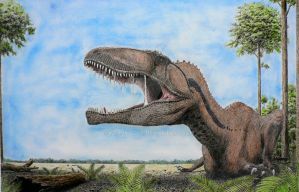 I'm really curious to know , see the amount of details , it's very close to some of the best Paleoartist of the world ! Keep up your work good ! Good luck to draw every genus of dinosaur , I think you can do it ! I like what I saw , all these dinosaurs are , for each , masterpieces ! I have a wish , if you want and if you can , could you make an Abelisaurus comahuensis ? it's one of my favourite theropods ! I didn't knoww he was that big ! Frightening ! Can you tell how many hours do you spend on your draws , because I see all the details , I guess you take a lot of time to make them ? danke, das der fächer so plötzlich daherkommt liegt daran das ich sinotyrannus eigentlich mit mehr federn darstellen wollte, aber auch irgendwie mit mer schuppen. Am ende hatte ich zu viel schuppen und wollte irgendwie noch ein paar federn "reinklatschen" und daraus enstand dann der fächer. Great! I like that you put a human in to show scale, makes it much easier to appreciate the size of the animal. dankeshr, ich persöhnlich mag auch so "mähnendinos"
Wow, quite an impressive beast!